The popularity of this event is indicative of the need amongst many corporates to provide an active event for their staff. 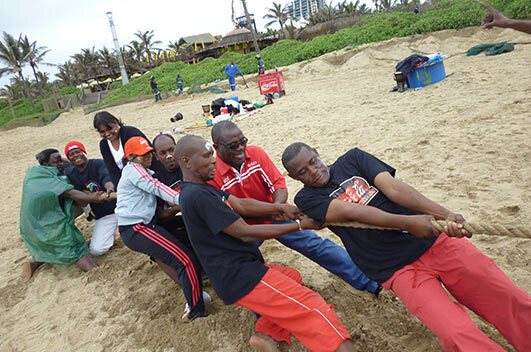 Beach and Bush’s Beach or Field Olympics team build combines an exciting morning or afternoon of low impact activities with a fun day on the beach or any sports field. Why not treat your staff and give them a day out of the office with a difference. Teams are scored according to a win, lose or draw system and the team with the highest score WINS! Although physical, the events do not require any serious level of fitness and participants are free to cheer their teams on in the event that they prefer to sit out some of the more active options. Each round robin takes 30 minutes; 20 minutes for the event and a 10 minute break to catch your breath and put your feet up. Beach & Bush will set up Gazebos on the beach or field for your team build.